SOAPBOX CREATIONS: Happy Birthday, Michele! Cute, cute, cute Laurie! You sure know how to rock the dies girl. This is darling and Michele will love it! Pretty card! I love the little scene! Fabulous card as usual :) I love the heart in the tree :) Love ya girl!! Beautiful card Laurie. You created such a fun scene, can't wait for my trees to arrive. What a sweet scenic birthday card, very fun! Totally adorable, Laurie!! Love the heart in the tree and the twine is the perfect touch. Laurie, I love what you have done with the tree. The sunshine impression plate in the tree circle is just genius. Love the card. What a happy little scene Laurie, Michele will love it!! Cute scene!! Love every details, Laurie!Glad that you are part of the blog hop for Michele! *Squeal!!! * This is so cute, Laurie! Love the perfect die cutting and debossing, so clever! So pretty! I'm loving to see how you've been using your new PTI goodies! CUTE! I LOVE that swirly tree with the heart!!! Soooooooooooooo sweet!!! I love that tree - adorable! Love your card, Laurie! Can't wait to have that tree die myself! Thanks for sharing! Oooh, love the texture you put on the tree-top! Awesome! Laurie - this is such a cute little scene! I love the texture in the tree top, and the clouds are just perfect! Great job! What a great use of the impression plate! Super cute card. Thanks for helping make Michele's day special! This is such a sweet birthday card, Laurie!! Love the way you put texture in your tree...and hand cut foam for your clouds...so creative...wonderful card:)!! I love every single part of your adorable card! Such a "happy" look. Oh my cuteness! Love the grass, fence, and clouds! It's like a whole little story, so sweet! Such a fun card. I love how you used the fence, tree, and the grass dies. This card is just darling! You always create the cutest little scenes--way to combine all of those fabulous dies! This card is beyond cute, Laurie! I love the sweet little tree and how you used twine on it- so fun! What a fabulous scene Laurie! I love the tree with its little heart inset and the bakers twine bow. *swoon* I'm in love! Such cuteness here! How sweet is this card?!! :) Soooo colorful and cute! This is really darling!!! The little red heart in the tree is wonderful! 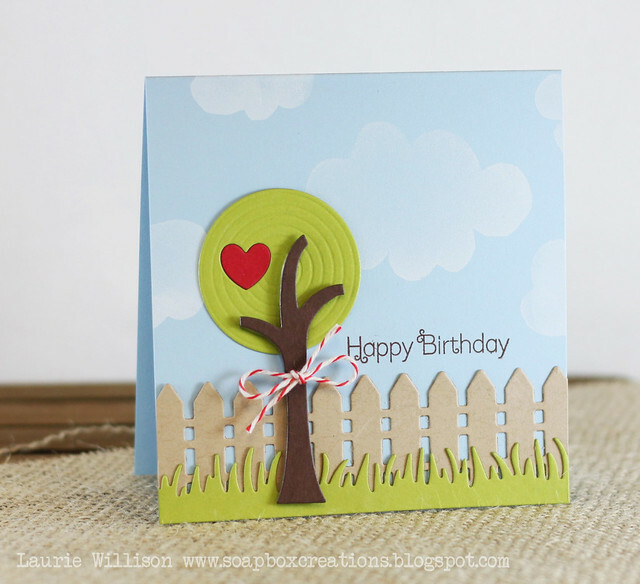 Love your use of the sunshine plate with the tree top! Cute cute card!